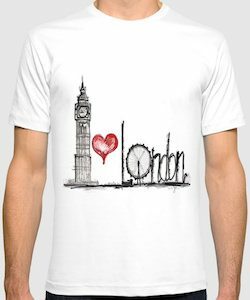 If you are planning to go to London or just like the capital of England then come check out this fun typical London luggage tag. The luggage tag is red and on the front you can see typical symbols of London like double decker busses, Tower Bridge, Big Ben, Soldiers, and much more. On the back of the luggage tag you can find the typical card slot with a card to write your information on it and as it is a piece of paper in a pocket you can keep changing it. So if you like a cute bag tag then this could be perfect for on your luggage. If you like Great Britain and need a cool bag tag then you need this Union Jack luggage tag. 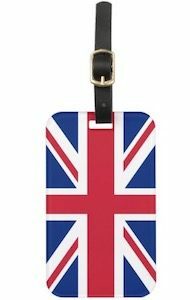 The luggage tag has the flag all over it and you can pick to have the same design on both the front and that back but you can also have the flag of England on one side and an ID card slot on the back. Now you can have this luggage tag on your suitcase and everyone knows where you are from or want to go. A bag tag like this is great looking and made to last and besides you suitcase, you can use it on your sports bag to so that you never have to lose that one again.